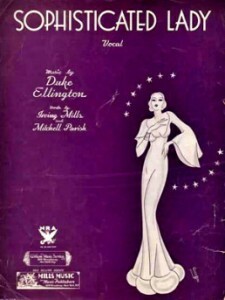 Duke Ellington wrote “Sophisticated Lady” in 1932 as an instrumental. Lyrics were added later by Mitchell Parish. Ellington is said to have been inspired to write this song by two of his grade school teachers, who toured Europe in the summers after teaching all year. “To me that spelled sophistication.” “Sophisticated Lady” was first recorded in 1933 on the flip side with Harold Arlen’s Stormy Weather. It is, of course, one of Ellington’s most popular and often-played songs. In addition to numerous recordings by Ellington over the years, the song has been recorded by Art Tatum, Anita O’Day, Billie Holiday, Billy Eckstine, Johnny Hodges, Sarah Vaughan, and Glenn Miller. This song was recorded on February 28, 1960 and released in 1960 on the album Alone Together. “Sophisticated Lady” was recorded in 1973 and released that year on the album Tony Bennett’s Greatest Hits, Volume 7. It was arranged by Torrie Zito. “Sophisticated Lady” was recorded in May 1999 and released that same year on the album Bennett Sings Ellington: Hot & Cool. It was arranged by Jorge Calandrelli. “Sophisticated Lady” was recorded in 2014 as a solo by Tony Bennett and released that year on Cheek To Cheek. It was arranged by Marion Evans.